Throughout the summer and fall of 2012, Sweet Bar Bakery has renovated the corner of the Packard Lofts building, breathing new life into the historic MacFarlane’s Candy and Ice Cream showroom at 24th and Broadway. And this time, the quality and source of the ingredients will be as important as the taste. 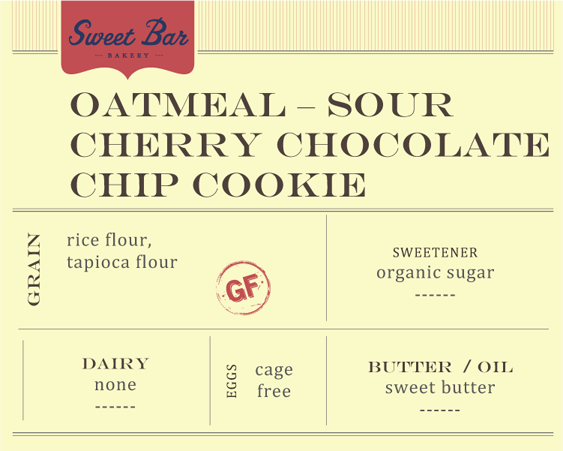 The INFO cards on each of our baked good conveys the essential information — name of each delectable item, type of flour or grain, how it is sweetened, and whether or not there are dairy or eggs and what type of oil, shortening or butter. If you need more information, feel free to ask. We take the time and effort to bake first and foremost for great taste, and also for a variety of health concerns - focusing as much on ingredient standards as on taste. Central Milling is our source for organic and whole grains, such as all purpose white flour, whole wheat pastry, whole grain spelt, stone ground cornmeal (organic, non gmo), rolled oats, as well as the gluten free rice flour and tapioca flours. Wholesome Sweeteners provides us with organic sugar and sweeteners such as organic agave syrup from the agave cactus, sustainably grown in Mexico. Northern California’s Clover Stornetta supplies our organic milk for our coffee drinks and offer organic whipped cream for certain desserts such as pumpkin pie. All our other dairy products are rbst free. All of our eggs are cage free. Organic palm oil is a thick, solid-at-room-temperature substance, very much like the Crisco style shortenings you may have grown up with, minus the hydrogenation. It tastes creamy and pairs wonderfully in baking, especially with chocolate. 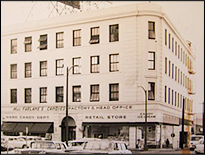 Guittard chocolate, started in San Francisco in 1868, supplies many of our chocolates such as chocolate chips, cocoa powder and unsweetened baking chocolate. Tcho, also a San Francisco start-up, is the secret to our truffle creams and the ganache for several of our cookie fillings and truffles. We seek organic produce as much as possible and call out a nod to the farmers when we can, right on the menu. All of our meats are free of additives, nitrates and other artificial substances. All of these currently on the menu, such as garbanzo’s for hummus, quinoa for salads, and split peas, white beans, lentils and black beans in our soups are organically grown. We will continue to seek out organic sources as much as possible. First and foremost, we feel strongly that all of our baked goods must taste great, whether made with the classic unbleached flour, butter and sugar, or rich and creamy vegan cupcakes or gluten free cakes, muffins and cookies. If it does not taste great, we will not be selling it! Therefore, we make information regarding vegan and gluten free items clear on the INFO cards but do not segregate any items, as we want everything available to everyone, no matter your personal dietary preference. 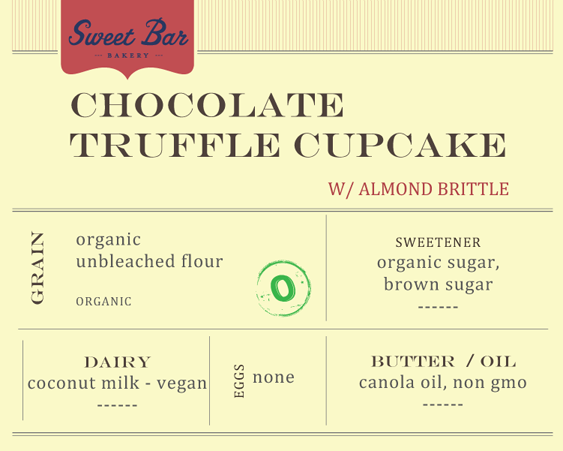 For vegan baking, we use organic palm oil and certified non-GMO canola oil in place of butter. Frostings may contain Follow Your Heart soy cream cheese, which does not contain lactase as many other non-dairy cream cheeses do. Our sugar is organic and free of bone char. We hope it is apparent, but it must be stated that we are not a gluten free facility. If you have an extreme gluten allergy or sensitivity, please consult with your doctor as to what is what is appropriate for you. Our basic gluten free blend contains rice flour, tapioca flour and a small % of guar gum, a natural thickening and binding agent that comes from the guar bean. We make every effort to make our gluten free items segregated from other items containing wheat in order to avoid cross contamination. The mixer and mixing bowls, portion control scoops, etc., are all cleaned meticulously before gluten free runs, and we tend to make these items first up in the daily roster. There will, however, be some inevitable exposure to wheat in a small bakery such as ours. We pride ourselves on baking for everyone and making every sincere attempt to honor the dietary choices of our customers. Please feel free to call or ask for specific information. Of course we are here for your special cakes and parties, wedding cakes, birthdays and anniversaries, to make cakes, cupcakes and dessert buffets delicious and memorable for all your guests! Mani Niall, (dubbed Baker to the Stars by Eating Well magazine in 1992), owned and operated a very successful bakery with a 20 year run. As the founder of Mani’s Bakery in Los Angeles in 1989, Niall created and refined a style of baking which has never been repeated in a retail bakery format. He learned his craft alongside Chef Akasha Richmond (of Los Angeles’ celebrated Akasha restaurant), at the Golden Temple, a classic old school vegetarian restaurant. They revamped the restaurant, making a name for themselves as innovative chefs and attracting an eclectic Hollywood clientele. Michael Jackson, a restaurant regular while he was recording Thriller in a nearby studio, whisked Niall off to become his first private chef. After several years as a private chef and caterer, Niall noticed a lack of great baked goods within the natural and organic foods sphere. Most places were devoted to one culinary idea, such as whole grain, low fat or vegan. Niall decided first and foremost he would open a great bakery with an all-inclusive menu celebrating good food; no matter what your dietary choices you would find something in the bakery case. With this credo he opened Mani’s Bakery, an organic, artisan venture located on Fairfax in Los Angeles. The bakery has been profiled in Food & Wine, Details, LA Times, the Hollywood Reporter, People, Vogue, Pastry Arts, Shape, Elle, Longevity and Vegetarian Times. Since then he has written three cookbooks, which reveal the world of baking with natural and organic ingredients - Sweet & Natural Baking (the Mani’s Bakery cookbook), Covered in Honey (exploring the world of varietal honeys) and Sweet! (discovering how to bake with sugars from around the globe). The fourth cookbook, Good Morning Baking, is on the way spring 2013. Niall built a gingerbread country estate for a San Francisco Millennium party, developed heirloom tomato pasta sauces and vegetarian entrees for food manufacturers and is on the chef panel at the Center for Culinary Development.